Since its launch 21 years ago, Bova has earned an unassailable reputation for delivering quality engineering in the safety footwear market, both locally and beyond our borders. The Bova brand, which has been built on a foundation of innovation, quality and passion, has now entered an exciting new era by extending its portfolio to include purpose-engineered safety wear. Bova is a brand of BBF Safety Group (Pty) Ltd., a proudly South African company that employs over 1600 people and remains committed to the local manufacturing sector, job creation and economic growth. We are proud to lay claim to the fact that, like our footwear range, our safety wear is manufactured locally (RSA) in an ISO:9001 accredited factory with the same quality, precision and product-engineering that has made our footwear the leading brand in Africa. Our inaugural range of safety wear will include a range of overalls, boiler suits, dust coats and high visibility work shirts targeted towards Mining, Construction, Manufacturing, Agricultural and State Owned Enterprises, both locally and beyond our borders. 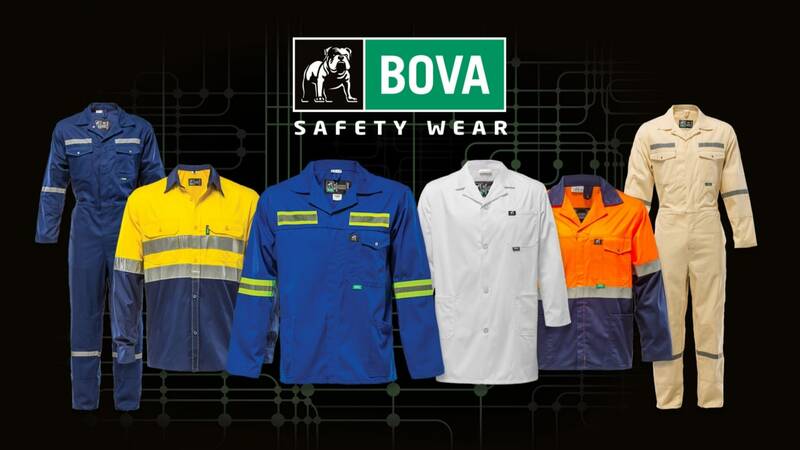 Garments in the Bova safety wear range meet the same manufacturing standards as the footwear portfolio, with an emphasis placed on quality, comfort and value. It is this ethos that has garnered Bova the enviable position of being the preferred brand of procurement managers in South Africa . Bova safety wear provides a perfect fit between comfort, safety and durability and the garments are available in a range of fabrics, specifications and weights incorporating internationally renowned YKK zips and VizLite ™ reflective tape. The garments have been tailored specifically for the South African market with features that include a wider back yolk and extended thigh space as well as increased durability through triple stitched seams and bar taking at stress points. BOVA Safety Footwear is a proud brand of BBF Safety Group (Pty) Ltd, the largest manufacturer of safety footwear in Africa. Over a million pairs of BOVA safety shoes and boots are manufactured annually for the South African market alone. In addition, we export our footwear to 19 African countries and the Middle East, constantly expanding into new markets.